I love blogging and the opportunities that have come my way. But in the same breath I find some of the offers I receive to be totally ridiculous. It seems that PR Agencies do not take into account that there are costs involved with writing and maintaining this blog. I do my best to only make things we will eat so I am not wasting money on ingredients. I was recently asked if I wanted a voucher from a delicatessen in another town. I often visit the main city centre and so replied in the affirmative. However when the voucher arrived as an attachment I was told in the email it would expire in December. As I had no plans to travel into Cape Town before it expired, I replied to the PR person that I would probably not make use of it, and did not open the voucher. Turns out that for less that the cost of the petrol, they wanted me to review the restaurant, and use the voucher to offset part of the costs of the meal. I think this is totally nuts! What is not totally nuts is this must make recipe for roasted cashews. They are perfectly crunchy, deliciously sweet and the chilli comes in at the end! 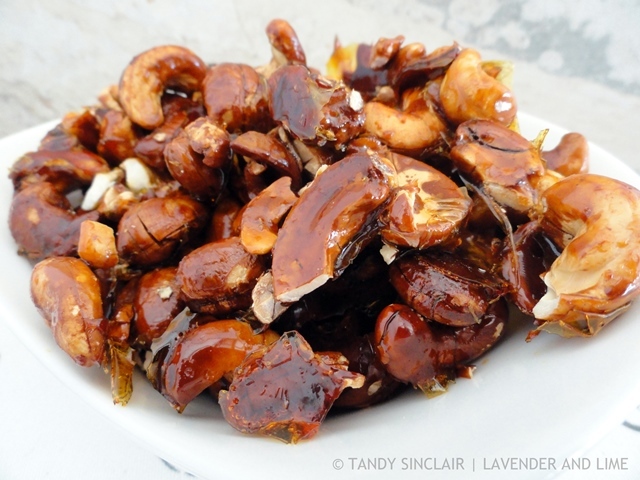 I hope you will find yourself making these sweet chilli roasted cashews and that you won’t think I am asking too much of you to make them. I would much rather faceplant into these nuts than waste time going nuts of the PR firms and their shenanigans! Sweet and spicy, that is right up my alley. I could probably eat that whole bowl in one sitting. I review PR/advertising opportunities very critically. If I feel that it is something that perfectly lines up with Healthy global cuisine, then I agree if the compensation is correct. Otherwise it is a no go. I write because I have a passion for food and culture. You are so right, Tandy! No! Your spiced cashews look fantastic to snack,on, or to top a lovely salad for extra crunchyness & spicyness too! MMMMM! What a great idea to put them onto a salad! I love cashews and these sound so good, a nice alternative to crisps. Making and eating these sounds like a MUCH better idea than the ridiculous offer you were given. I will have to make them again to try them with some beer – great idea! I find cashews SO ADDICTING!! These look SO good! my grandmom used to made this all the time…..
Don’t these look delicious! Gotta love cashews! One summer me and the fam. went to Montreal Canada and got the best fresh cashews ever! When we went back the next summer we looked all over the city to find the vendor! Just our luck, they were still there! YUM! 🙂 great recipe!! Oh the things that PR companies expect us to do. And for FREE no less! I’m glad you said no to that ridiculous offer. Also, pretty sure these cashews are an addiction waiting to happen! Happy Monday Tandy! I definitely think these cashews are worth making, they look scrumptious. I love cashews! The older I get, I start to realize more and more that it’s not the fat that’s killing me, it’s the “bad stuff” I eat. And cashews are such good fats and just satisfy, but roasted…yum! Crazy the way some people contact you for offers. I have had some strange offers myself even in the relatively short time I’ve been blogging and I guess the one thing I’ve learned is that even if they’re offering something for free or offering me $$ to do something, if I don’t like the product or service right form the get-go then I need to just say no! Have a great afternoon Tandy. Oh, I love these nuts – that chilli in there delicious. I won’t bother commenting on your offer from the PR agency!